2. Placement of nodes and gateway. Internet connection and router firewall configuration. Wireless network connectivity verification. 3. Placement of sensors. Validation of data. Tutorial on U.I. and how to look at and use the data. Installation of a node at Stage Coach Vineyards 5/4/11. Note far vineyards in the distance which also have nodes installed and are part of the same network. Standard mount is on a 10ft. tall heavy gauge conduit pipe using a stainless hose clamp which keeps the node above the canopy all season. Below is a view of the eKo View User interface with the Stage Coach Vineyard map and all 16 node locations. Green and Red Vineyards, drilling holes for soil moisture sensors -easier. The 1-1/4" x 36" soil moisture drill used to bore holes for watermark sensors. The cordless drill shown above is used to drive the drill through the soil. Sensors are normally planted in spring when the soil is still wet and relatively easy to penetrate. 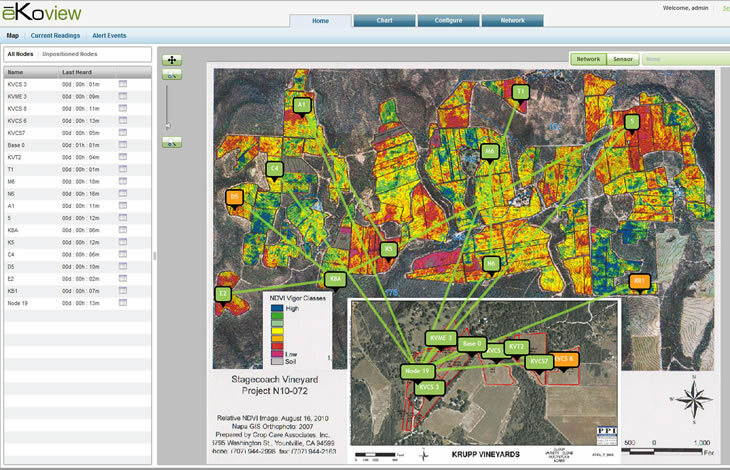 It's a good idea to note the soil types encountered at various depths at each sensor site and enter them into comments in the eKo View interface for use when interpreting the data. Below is an echo eC5 water content sensor and a Watermark Soil moisture Tension sensor. Typically 3 Watermarks are planted in the same hole at 12", 24" and 36" depths with moistened, compacted soil in between the sensors in the hole. Lower wire management, note PVC pipe 8" down into soil to protect wires to irrigation line, conduit pole in the channel of a highway stake, cable tieing of excess wire. Below you can see on the right the 3" hand auger we sometimes use for boring holes. This photo also shows a temperature/humidity sensor installation and the radiation shield covering it. This is the best way to measure temperature in the fruiting zone. Sometimes rocky soils require use of a 3" hand driven auger to drill the holes and worst case as was the case at StageCoach Vineyards, Atlas Peak 5/12/11 an exceptionally rocky vineyard requires a jack hammer to drill sufficiently deep. In some cases we were unable to go deeper than 15". Weather station and soil moisture sensors installed at Green and Red Tip Top vineyard. Installing a node to monitor water meter and soil moisture at Green and Red Vineyards in Chiles Valley 6/11. Water meter interface and tranceiver node mounted on a 10 ft. 3/4" conduit pole. Below is a photo of the first actuation system installation. Here it controls 4 valves to irrigate landscape. Camalie Networks eKo Pro eG3100 Gateway: eKo View 2.4.31 Grapher/User interface, Apache Web Server, sqlite Data Base, base radio interface, Ubuntu 10.04.3LTS, dual core Intel Atom Processor, 1 GB RAM, 500GB hard drive. 40 watts. Auto reboot after power fail. You can put your own Vineyard web content on this server too using remote desktop. Below is an actual installation at the Hollister public works building. Note the base radio is shown to the upper right of the server. This server is a Lenovo Q100 based server which uses less than 25 watts and has been very reliable. The dangers of non wireless sensing. Your transmission can fail at any moment on a hillside. Last modified: 9/15/11 Note on pronunciation: Camalie rhymes with "family"